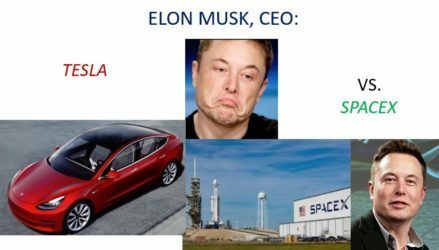 I’ve been a huge fan of Elon Musk, even before my husband first drove home his Model S. After participating in a Harvard case study about him, then reading Ashlee Vance’s Elon Musk biography, I was even more enamored. I bought some stock. I even ordered a Model 3 on March 31st, 2016, the first day Tesla started taking orders – and took delivery just eight days shy of two years later. Meanwhile, SpaceX has been shooting up privately-funded rockets for over 10 years, including the Falcon 9’s launching 11 communications satellites into orbit. Earlier this year they launched the most powerful rocket in operation in the world. The payload was Musk’s Tesla Roadster sports car, with a dummy astronaut called “Starman” in its driver’s seat. Yet, Elon has increasingly been acting like the dummy behind the wheel of his space-bound roadster in recent months, especially in his tweets. August 7th Elon first announced he might buy back the company. That cost him the Chairmanship of Tesla for three years and a $20 million fine. Then, days after reaching an agreement with the SEC to settle the fraud charges they leveled against him, he poked the bear in the eye with a sharp verbal stick, saying “Just want to [say] that the Shortseller Enrichment Commission is doing incredible work. And the name change is so on point!” What was he thinking?! The key for Tesla to start avoiding these unnecessary crash landings would probably be taking a similar approach to what’s worked so well at SpaceX. And it wouldn’t even take rocket science! Unfortunately, Elon doesn’t appear to have a Gwynne aboard the senior management team at Tesla. And, his only female board member, Linda Johnson Rice, CEO of Johnson Publishing and related Ebony brands, just came aboard last year – perhaps not long enough to have had an impact on tempering Elon’s Tweeting impulses. Against the unfettered backdrop of Elon Musk’s Tweets, earlier this month, Governor Jerry Brown signed a law requiring that all publicly traded companies with headquarters in California have a least one woman on their boards by 12/31/19; and that companies with at least five directors will need to have two or three females among their directors by year-end 2021. Those that don’t will be fined $100,000 the first time, and $300,000 thereafter. While many are balking at this new requirement, making room for fresh faces in board rooms around the country – not just in California, will be a step in the right direction towards also requiring term limits. Frankly, there could be other reasons that Fortune-500 companies with the highest number of women directors ended up with higher return on sales and equity than their peers with womanless Boards: for example, their overall enlightenment and business savvy enables them to make a lot of correct decisions, including not keeping women off their boards. Obviously, the key will be finding the right women to serve – and to stand up to their Chairmen/CEOs with a propensity for going off the rails. Given my personal observation and 15 years of experience on the Good Samaritan Hospital Board, the doctors, lawyer, architect, and other professional women who surround our chairman, Charlie Munger, and president, Andy Leeka, have made significant contributions to the hospital’s governance over the years. And, I’m certain Elon would benefit by taking input from any one of them – as a direct report, confidante, or influential board member!